"NHL 07 is an ice hockey video game. 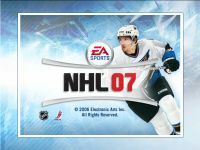 It was released on September 12, 2006, the successor to NHL 06. The game improved the series' gameplay with more realistic features, such as stickhandling and a wider variety of controller schemes. The Xbox 360 version features a completely revamped game and graphics engine from the predecessor, while the other versions are left behind with the old engine. It is the only game in the series to have a PSP version." Source: Wikipedia, NHL 07 , available under the CC-BY-SA License.